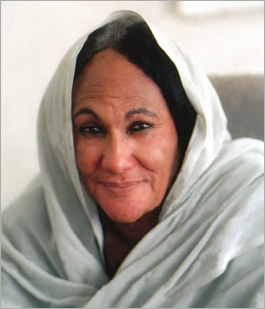 Amal Abbas was the first Sudanese woman to be editor-in-chief of a major political daily. In April 1999, she set up and became chief editor of Al-Rai El-Akhar (Other Perspectives), with a simple editorial policy: “The newspaper is firmly committed to the principle of giving space for other, alternative opinions, whatsoever they may be.” The publication was closed on multiple occasions by the authorities and faced frequent suspensions by the government’s National Press Council. Between May and September of 1999 alone, the paper received seven suspensions, with the result that it was not published on 72 days. In February 2001, Abbas was sentenced to three months in prison for failing to pay a fine of 15 million Sudanese pounds (approximately $5,800) after the court found her and a reporter guilty of libel. The charges were based on an article written by the reporter, Ibrahim Hassan, alleging corruption in the local government in Khartoum State. The court also ordered the newspaper Al-Rai Al-Akhar to pay a fine of 1 billion Sudanese pounds (approximately $390,000) for publishing the article. “I am always going up against censorship. The security men come every night, looking at what is going out and removing what they like. And it’s forbidden to leave an empty space,” Abbas told the Agence France Presse in December 2001. Amal Abbas was born in Omdurman in Sudan and attended Cairo University’s Khartoum Branch, where she received a BA in social sciences. Later she travelled to Cairo to study in journalism and started working since 1970. She covered student affairs for a magazine called Women’s Voice. For 11 years, she was editor of a weekly column in a newspaper. She then moved to another major daily, and in 1997, she was named chief editor of a social and cultural newspaper. Amal Abbas is the second Courage in Journalism Award winner from Sudan, following Saida Ramandan (1996).